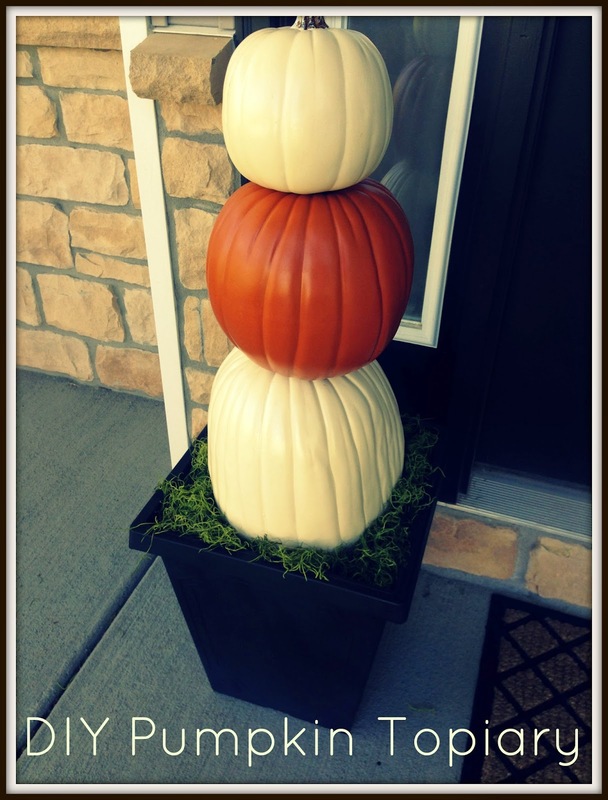 I'm back with a quick tutorial on making the pumpkin topiary I featured on my fall front porch. Here's all my stuff laid out. I had also bought some craft paint, but decided to forego painting the pumpkins so they'd be more of a Fall decoration and not just Halloween. I also had E3000 glue on hand in case the dowels didn't provide enough stability but my pumpkins haven't budged. I bought 2 large white pumpkins, 2 small orange pumpkins, and two mini white pumpkins. I wanted to stagger the colors of mine, but you can design it however you wish! I got my pumpkins at Michael's...on sale and with a 40% off entire purchase coupon. Start by cutting the stems off your two bottom pumpkins. You will need a hole for the dowels to travel through, and the stacked pumpkins will cover it right up anyway. Here's what you will be left with after removing the stems. Remember not to remove them off your smallest pumpkin since it will be showing on the top. Next drill holes in the bottom of all three pumpkins, again to leave to space for the dowel. I kinda drilled and then stuck the dowel in to judge if my holes needed to be bigger. After that's all done, slide your stack o' pumpkins onto the dowel and show your husband your awesome handiwork. Spoiler Alert: He will still be more interested in football. I didn't document the very last steps, but finish up by filling your planter to the top with soil and then stick each dowel with pumpkins down into the center.For reference, my planters are about 16" tall, so the 36" dowels were perfect. I tucked some decorative moss down around the sides a few days later just to make it look a little prettier. Super easy & super cute!